As Pakistan is a fastest growing e-commerce markets around the world, and unfortunately we currently have no Online Pakistani own payment gateway which meets all the requirement and provide the well rounded solution at one platform. We can see many e-commerce startups nowadays in the market. When it comes to making an e-commerce website the first question comes in our mind that which payment method should we add on Pakistani eCommerce website? There is only one option which we may considered as a default Pakistani payment gateway, and that is COD (Cash on delivery). Some of our Pakistani banks now allow their customers to use Bank Visa Card on a website for purchases but still not fully functional, In this post, we are going to discuss only Online Payment Mediums, online payment gateways which allow you to get an account by being a Pakistani. As you all know PayPal not allow Pakistani users to create and manage account so getting PayPal account in Pakistan for business is really a trouble. If anyhow you are going to get it trough your Friend, family from abroad than who is going to pay you for it? Because you are going to setup a website in Pakistan and how you can expect Pakistani users to pay you through PayPal who have no access to PayPal. Did Skrill allow in Pakistan? Yes, Skrill allows you to create the account by being a Pakistan users, you can easily verify your Skrill account and use it on your website to receive direct payments from your customers/clients online. 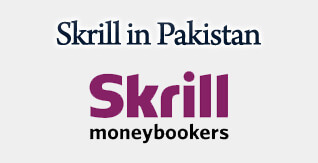 After verifying your Skrill account, you can also easily withdraw skrill dollars to your local Pakistani bank. Can I withdraw Skrill to Pakistani Bank Direct? Yes, you can direct withdraw your Skrill fund to your bank account, you just need to add your bank account in Skrill and make a withdrawal. Last but not least with 2Checkout you can receive payment through PayPal and Credit Card, all though you can verify your 2Checkout account with Payoneer also. 2Checkout works fine in Pakistan it should not be considered as a good option only due to high fee and not good support against the transaction disputes/reversal, But still, nothing is better than something you must give it a try to understand how payment gateways work. These were currently possible payment gateways which are readily available in Pakistan, however, if you are using any other and wanted to share your experience, please let us know below in comments. It depends which platform/Script/cms you are using? There are Addons/plugins premade available for any specific CMS/Script. Absolutely, We can only hope for good that we already doing from ages. Any news about easypaisa payment method like we can accept credit card payments with that? Please do contact to Easypaisa Shop / branch for info. Can you tell me any specific payment medium which will help us to accept credit card payment online in our website? With 2Checkout you can accept credit card payments online in Pakistan. 2checkout will eat our all money if we are accepting it as a pakistan user our 50% of earning is going with their fees.